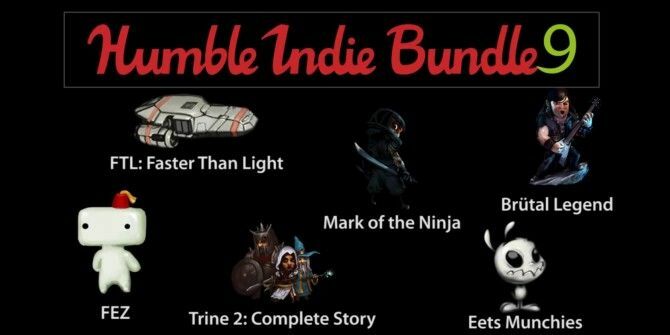 Humble Bundle, the pay-what-you-want cult favourite to grab independent games 10 Indie Games So Good, You’ll Forget They’re Indie At All 10 Indie Games So Good, You’ll Forget They’re Indie At All There may be times, however, where you want something different from the indie norm. A game that follows indie values, yet is made with the quality that top-shelf AAA games are known for. Titles like... Read More and support charity, is back in its 9th iteration with six DRM-free games for Windows, Mac and Linux, all of which come with a Steam key if you pay $1 or more. By default, you get four titles: Eets Munchies, Brutal Legend, Mark Of The Ninja, and Trine 2: The Complete Story. Spending more than the average buyer unlocks Fez and FTL: Faster Than Light. Humble Bundles are a great way to get quality games at low prices Looking for Great Games at Pauper Prices? Score Some Game Bundles Looking for Great Games at Pauper Prices? Score Some Game Bundles Read More . Here’s a little about this time’s titles. Eets Munchies is all about solving puzzles and helping an adorable creature devour cake in a beautifully animated game. Brutal Legend, a game about a metal band roadie’s awesome adventure, comes from the mind of Tim Schafer has the voicing of Jack Black. What more do you need to know? Mark Of The Ninja is a side-scrolling game that makes you choose between stealth or slaying as you need to go past the guards with distraction and attack items, like darts, noise makers, and grappling hooks. Trine 2: The Complete Story is the sequel to one of the best platform games The 10 Best PC Platformers Under 10 Bucks The 10 Best PC Platformers Under 10 Bucks The PC probably is not the average gamer’s first choice when it comes to platforming, but this is only because other genres overshadow the robust selection of platformers that are available for computers. In fact,... Read More , where you have to switch between a knight, a wizard and a thief in your noble quest to defeat evil goblins and dragons. FTL: Faster Than Light is a top-down space strategy game in which you have to manage your spaceship and crew while fighting intergalactic enemies. Fez features Gomez, an adorable character with a magical fez that lets him rotate the world he lives in, effectively turning 2D into 3D and thus letting him solve puzzles by getting to places he couldn’t reach before. Whatever you finally decide to pay for the Humble Bundle 9, it can be split between the games’ developers, charity and the Humble Bundle guys. Explore more about: Mac Game, Puzzle Games, Strategy Games. If I hadn't bought FTL (one of the best games ever made IMO) a few months ago, I would have picked this deal up. Fez looks like a great title, too. Is Brutal Legend really that good? It just doesn't really look at that engaging. Brutal Legend is not a new game, but yeah, it's great fun if you like games like Monkey Island and Grim Fandango (same creator). Wow, I just bought it. It was like an involuntary reaction to you using the words "Monkey Island" and "Grim Fandango". Just bought this yesterday, am really excited because I was going to buy Fez anyways. Loving everything so far. Played Fez yet? If yes, how do you like it? I can't believe Brutal Legend is part of this deal!